Gunpowder barrels now have a fuse, skeletons are less like lethal snipers, and improvements to network bandwidth! Sea of Thieves has received another patch in the form of version 1.1.4, which has made the seas a little bit more dangerous thanks to the current Bilge Rat event: Gunpowder Skeletons. These patch notes address a variety of bug fixes, performance improvements, and acknowledgments of issues that some players are still receiving. With only a month before the second piece of free DLC launches, make sure you know about everything coming to Sea of Thieves in Cursed Sails and Forsaken Shores! In the event you are struggling to get the game to update on PC, we have a guide for that. Vigilance, a loaded gun and your best running shoes are all critical for this explosive Bilge Rats Adventure! Gunpowder Skeletons Event – Carrying a gunpowder keg, skeletons can now rush towards you, light their fuse and... BOOM, off to the Ferry you go! The Bilge Rats are challenging all brave pirates to defeat them in various ways, some less conventional than others! Keep an ear perked for a burning fuse, and a finger on the trigger... good luck! Explosive Force - When detonated, gunpowder kegs now have the force to rock and push ships. Fuses - When holding a gunpowder keg, players can now light a five-second fuse by pressing the primary action button (Right Trigger on controller or left click on mouse). 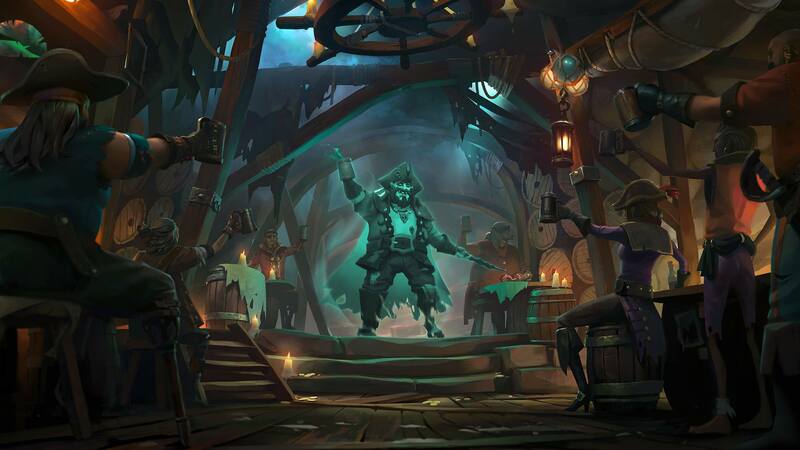 Bilge Rat Doubloons – Each Gunpowder Skeleton Commendation on the progress screen details the number of Bilge Rat Doubloons it rewards. Players have until the 10th of July to complete the Commendations and earn up to 150 Bilge Rat Doubloons. 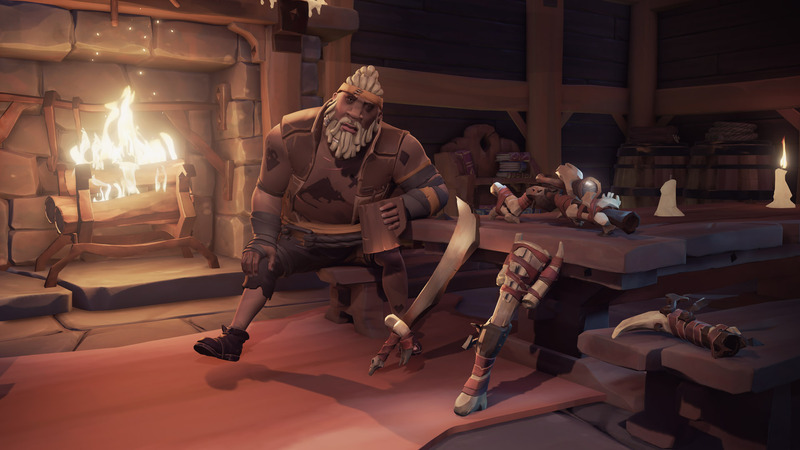 Bilge Rat Cosmetics – The Bone Crusher Sword, Pistol, Blunderbuss and Eye of Reach, priced at 15 Doubloons per item, are available until the 10th of July. Letters of Recommendation – Letters of Recommendation now grant a full level in the chosen Trading Company. Opting to spend your hard-earned Doubloons on reputation with the Trading Companies? This just got better! Bilge Rat Titles – Completing the Gunpowder Skeletons Commendations will unlock two new Pirate Titles. These titles will unlock straight into your Vanity Chest for maximum bragging rights. Legendary Commendations - Legendary Commendation to earn an additional 50 Doubloons! These Legendary Commendations have been added based on player feedback requesting replayability. Megalodon - Megalodon behaviours have been updated and improved. Skeleton Accuracy - Skeletons wielding a blunderbuss or pistol have had their accuracy reduced. This was tweaked due to player feedback. Joinable Status - Players can now make themselves unjoinable from the new Crew Management tab within Settings. This will mean that even friends can no longer join your session. Bilge Rat UI - The reputation summary and icon have been updated with improved visuals. Reduced client memory usage on PC. Improved network bandwidth usage which may in turn reduce latency experienced by players in busy scenarios. Improved server performance which will reduce latency for all players. Multiple server and client crash fixes. Further improvements and optimisations for all platforms are ongoing. The turning speed on the Galleon has been corrected. Being poisoned by a snake no longer shows the VFX a second time. Large button prompts no longer overlap. Certain hairstyles no longer show being tucked into jackets. Megalodons will no longer collide with islands when following a ship. Skeletons at a Fort no longer lose their textures once the Captain is killed. Majestic Sovereign Trousers no longer visually tear. Bilge Rat Doubloons have not been correctly rewarded to a number of players who earned them through the Skeleton Thrones event. We are investigating a resolution for this and will share information when available. The Hungering Deep rewards were not received by a number of players who earned them. We are currently rolling out a fix for this issue which will award missing rewards from The Hungering Deep. This will take some time, so keep an eye on the weekly patch notes to see when the rollout is complete. Resource barrels on ships will periodically re-stock if they are below the default level of stock. There is quite a lot to unpack here. Let’s start with the new Bilge Rat Adventure, the Gunpowder Skeletons. The limited-time event tasks pirates with defeating these skeletons in interesting and unique ways (keep an eye out for our guide on how to defeat the gunpowder skeletons) in order to earn doubloons. The doubloons can be spent on four unique bone-themed weapons (sword, flintlock, blunderbuss, and eye of reach) each priced at 15 doubloons. Players who manage to clear the event should find themselves with 100 doubloons to spend, and another 50 are on offer for completing the Legendary Commendation portion of the event. These Legendary Commendations were added after Rare heard that players wanted more reason to go back and replay activities – something we talked about with Executive Producer, Joe Neate. If players purchase all the weapons they will still have 90 doubloons left over to buy the recommendations, which now give an entire level. There’s no word on whether players who previously purchased the recommendations would be retroactively awarded the necessary experience to bring it up to par. Regardless, this will make the grind to Pirate Legend a bit more bearable. As for the general updates, the skeleton accuracy has been tweaked, making them less like laser-focused homing missiles and more like undead threats. Players can also take their crews one step further by making themselves entirely unjoinable, preventing friends and followers from randomly filling an open spot you were saving for someone else. Of all the fixes, the one I’m most saddened to see addressed (though it absolutely had to be fixed) is the turning circle of the galleon. Galleons will no longer be able to manoeuvre as swiftly as a sloop, hopefully giving sloops a fighting chance of survival. 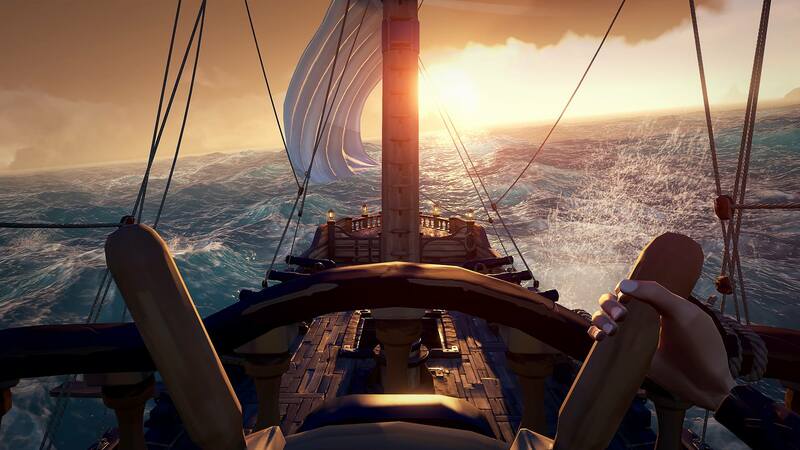 Rare continues to show their commitment to bringing new adventures and content to the world of Sea of Thieves. We here at Shacknews adore this game, and we’ve stated it many times, if you don’t like Sea of Thieves, you don’t like games. If Rare continues this pace of introducing new Bilge Rat Adventures on a bi-weekly basis, we should see a new adventure the week of July 10th, which is when the Gunpowder Skeleton event ends – so get out on the Sea of Thieves and defeat some skellies! Be sure to check out our Sea of Thieves guide and walkthrough for more helpful articles. Awesome, really need to get back into this game. While I agree the game needs variety, even if it's a slight variation of existing skeletons.